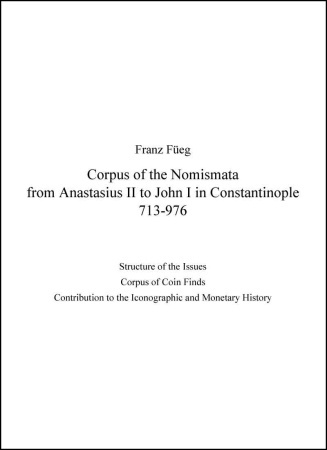 Füeg, Franz - Corpus of the Nomismata from Anastasius II to John I in Constantinople, 713-976. Structure of the Issues. Corpus of Coin Finds. Contributions to the Iconographic and Monetary History. Lancaster, PA, and London, 2007. Hardbound with dust jacket. CD-ROM included. Edited by Italo Vecchi. 196 pp., illustrated with 352 coins. The first comprehensive catalogue of almost all the gold nomismata struck at Constantinople from 713-976, this book compiles the material accessible in museum collections and publications, as well as previously unpublished specimens from both finds and private collections, and provides a detailed overview of the output of the Byzantine imperial mint during that critical period in that empire’s political and economic history, when its influence in Italy was drastically waning and it faced stiff opposition from rising Islamic influence in Anatolia and the Levant. The author has exhaustively researched this subject and built upon the existing wealth of material, creating a die corpus for each emperor during this period. The first part offers a detailed introductory commentary by way of an historical overview of the period and an in-depth synthesis on the issues of each emperor covered, including a detailed revision of the arrangement of series, chronology and iconographic types. The second part contains the catalogue of the nomismata coinage minted at Constantinople between 713-976, as well as silver and copper specimens struck from nomismata dies. The coins of each emperor are arranged in chronological series of issue and divided within each series of issue according to die variety. The catalogue also contains a section covering imitations and forgeries. A corpus of site finds provides an oversight of the geographic spread of the nomisma. A detailed discursus present the complex iconography not only on the coins, but also on the dated imperial seals and bullae. An accompanying CD-ROM will illustrate each of the 7,780 nomismata listed in the Corpus. A detailed bibliography of the most current scholarship on the field is also provided. This well-researched book will be the new standard reference for the gold, and will prove beneficial not only to numismatists and collectors, but those interested in the history of this fascinating period. An essential reference for historians, for the specialized collector, as well as for dealers, and institutions. Yu Liuliang Yu Hong. Art of China. Chinese Coins. Money in Hystory and Society. I ed. 2004.